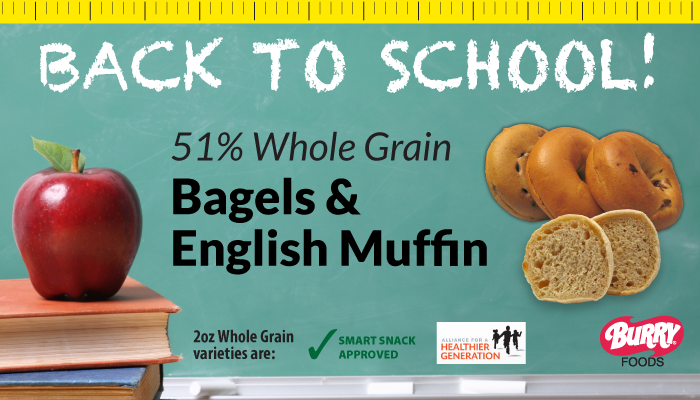 It’s that time of year again and Burry has Bagels and English Muffins that meet the school standard of 51% Grams of Whole Grain. Our 2oz, 2.3oz and 3oz products also meet the 200mg of sodium or less standard. Five of our products meet the Alliance for a Healthier Generation Smart Snack status! Bagel flavors include: Plain, Wheat, Cinnamon Raisin & Blueberry. Bagel varieties include: 4oz, 3oz, 2oz, 2.3oz as well as an individually wrapped Whole Grain Plain. A complete listing of our entire line of 51% Whole Grain items can be found here.